Earthworm Jim is a very amusing game. The graphics and sounds were great, along with a huge amount of comic relief. There were a whole bunch of funny things he would say that were just hilarious. This was also one of the first games I played that featured the very cartoon looking graphics. Earthworm Jim was a very popular game for a while. It even spawned a TV show and a comic book. They didn't run very long, but did okay for a while. 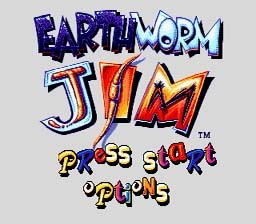 Earthworm Jim is a fun game, and if you haven't tried it, I suggest you give it a go right now. Find Princess What's-Her-Name before Psycrow does. Pause the game and enter: A + B, C, C, A, A, B, B, B + C.